There is disagreement among historians as to whether the following incident took place on March 13 or March 30, 1644. Maisonneuve’s settlers who had founded Montreal in 1642 were spending their second winter there. Their activities were restricted because the Iroquois often waited in the woods outside the stockade ready to kill anyone who ventured out. Maisonneuve’s men usually knew when the Iroquois were there because in the garrison was a dog called “Pilot,” who would howl the moment she scented the Indians. She had six puppies who learned the same trick. On March 13 or 30, as the case may be, Pilot and her puppies began to howl. 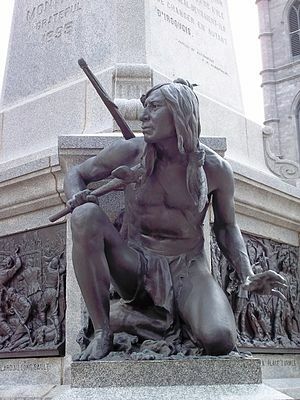 Maisonneuve’s men clamoured to be allowed to go out and attack the Indians. Maisonneuve realized the danger but agreed to lead the assault. It was a mistake. No sooner had they entered the woods, than they realized that there were a great many Native Indians there. Furthermore, they had guns as well as bows and arrows. The Iroquois, greatly outnumbering the French, spread out in an encircling movement. Maisonneuve knew then that he was trapped. The only hope for survival was to retreat along a path in the snow that had been made by hauling logs into the stockade. The Native Indians came racing out of the woods, leaping over snowbanks and firing their guns and arrows at the retreating French. It was only by the narrowest of margins that the survivors got back into the stockade and closed the gate. Maisonneuve was the last to enter. Three of his men had been killed, and others were wounded. Pilot has been commemorated as one of a group of figures in a statue in Montreal. Perhaps Walt Disney’s organization will produce a film about her as it did for “Greyfriar’s Bobbie,” of whom there is a statue in Scotland. Quite a story, I feel. Want to read more about Pilot (Pilote) and de Maisonneuve? You can begin your search at Dictionary of Canadian Biography Online; another really good place to go is Travels and Explorations of the Jesuit Missionaries in New France; and yet another new (new to me) website to visit would be Historion.net. Never heard of Pilot. It would be more fitting if Canada will do a film of this. Ha-ha! Canada does have quite the history, a lot of it we can be proud of which is awesome.